I just read “The Story of The Girl Guides in Scotland: 1908 -2000” by Elizabeth Robertson. 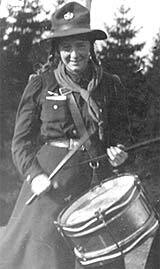 The girl pictured here is Allison Cargill who was the first girl in Scotland to attempt Girl Scouting. She joined in with a local Scout troop and her and her friends called themselves the Cuckoo Patrol. Senior Section first appeared in 1916 in Scotland (known as Senior Guides). Lones in Scotland first appeared in 1919 (though apart from a couple of camp references and a couple of Queen’s Guides little mention is made). The original cooks badge required you to either skin and cook a rabbit or pluck, truss and cook a chicken. The first Scottish Commissioner (known at the time as Deputy Chief Commissioner) was Loelia Buchan-Hepburn – she was 19 when she took on the role.